A disturbed young man goes on a killing spree in Smallville. Clark confronts the man and his gang and takes them down in the harshest way possible. Then he feels like he shouldn't have. Clark and his mother discuss this on the roof. Story - 1: I was disappointed in this issue. Writers are interesting people. They come up with story ideas, flesh them out, add characters and come up with ways to engage the audience. They want a reaction. Sometimes that reaction is as simple as making the people reading or watching their project feel good because the two protagonists finally fell in love. Sometimes they want to disturb the audience to make them think about a particular subject. Sometimes they slap a story together just to pay the bills. Every writer is different. Their styles are different. Their motivations are different. I'm sitting here trying to figure out what Max Landis was trying to say with this issue. I know the reaction he was trying to get from me. Showing a series of senseless acts of violence and Clark's reaction to it was supposed to shock me. I was supposed to be disgusted by it. 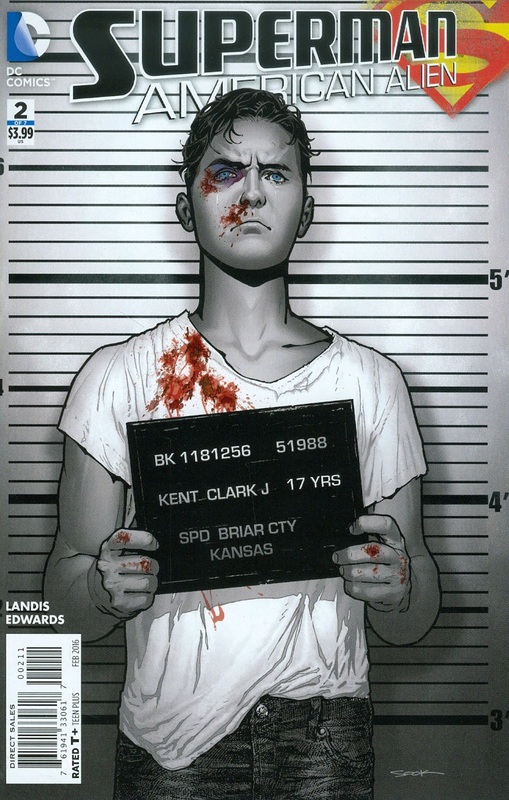 Then, when that initial feeling goes away I'm supposed to look at how different his take on a young Clark Kent was. I'm supposed to be moved by what he did and how he and those around him reacted. I'm supposed to think that it's daring and one hundred and eighty degrees from how touching the first issue was. And I might have felt that way. The problem is that Max Landis used all of the subtly of a knee to the groin to get those reactions. The funny thing is that it wasn't the violence or the reason the kid and his gang were on their spree that turned me off. I've seen this scenario a number of times on television shows like Criminals Minds. Small town. Vicious killings. It's nothing new or even shocking. Even Clark's reaction to it wasn't a surprise because I got the feeling that it was the direction Landis was going to go in. You don't kill people in a general store and then have Clark take them in peaceably. No, you have to make their punishment just as vicious as what they did in the first place. To be fair I might have let it all go. I might have just written about how I got where Landis was coming from and be done with it. But he shot the dog. Now I know that a real dog wasn't killed. This is a comic book. It's a mix of pictures and words. The thing is that I'm rather fond of dogs. I have three myself. I love them. I take care of them. I spoil them even. As the saying goes, the more I get to know people the more I like my dog. Even with that particular bit of baggage it wasn't that a dog was shot in the head on panel that really offended me, though that had a lot to do with it. Shooting the dog was just lazy. Max Landis had to show us how far he would go and killing an animal, especially a dog, sure does that. He went there. Look how daring it was. In a Superman comic to boot. Offensive, but only because it is creatively bankrupt. So all that good will from last issue? All of the good will from the nice bits of character work with Kenny and Lana and Pete and Clark in this issue? Gone. All because the writer took the easy way out. And shame on DC for letting him. Then again DC has had zero idea what to do with Superman for over a decade now, so I'm really not surprised. Art - 3: I've never been a fan of Tommy Lee Edwards. It's not that he doesn't have talent. I just don't care for his style. I suppose that style fit the story Landis was telling but frankly I'm so disgusted by this issue that I can't bring myself to give him points for that. This was an ugly story so it makes sense that it would have ugly art. Cover Art - 3: This cover is fine. The composition is compelling and the coloring gives it a real world look. The fact that once again we have a cover that is extremely misleading to what goes on inside the book is bothersome but frankly this was the best thing about this comic so I can't give it too hard a time. 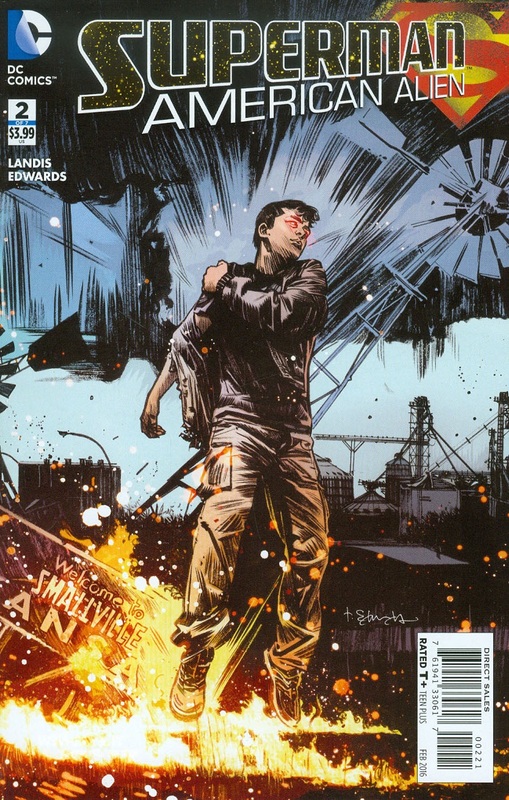 Variant Cover Art - 1: Hey, it's Clark Kent with the angry red eyes of anger floating in front of a burning and/or destroyed Smallville! Isn't that awesome? No. It's not. It's just as lazy as the story inside of this book.